Growing up in Duluth, Peggy Knudsen dreamed of a life as an actress. After taking advantage of opportunities to learn her craft in amateur theater productions and local radio, she left the Zenith City and made a career for herself in radio, on the stage, and in movies and television. Peggy was born Margaret Ann Knudsen in Duluth on April 27, 1923 to Conrad and Lulu Knudsen. Conrad, a Duluth native born in 1893, worked as a firefighter. Lulu (Haynes) also grew up in Duluth. The Knudsens lived in an apartment at 503 East 3rd Street. Peggy studied violin and claimed to have read all the books about the theater in the Duluth Public Library’s collection. She attended high school at the College of St. Scholastica’s Stanbrook Hall. Peggy’s mother and step-father separated in about 1935, and Peggy and her mother moved to an apartment at 1732 East 4th Street. Peggy graduated from Stanbrook Hall on June 11, 1940, along with 37 other women. Eight students received prizes for outstanding academic achievement, and Peggy received the award for the best essay on the subject suggested by the book Jesus of Nazareth. Peggy’s father died of a brain hemorrhage on the morning of July 30, 1940, after he had collapsed at Fifth Avenue West and Third Street in Duluth. At the time, he was walking to work from his apartment in Munger Terrace at 405 Mesaba Avenue. Shortly after that, Knudsen and her mother headed for Chicago so Peggy could pursue a career on the stage. In Chicago she found work singing in nightclubs, but she got a big break when she auditioned for a part in the CBS radio soap opera Woman in White, the first radio drama to depict nurses and doctors. Knudsen played the role of Karen Adams. She would later land roles on the CBS radio shows The Bill Goodwin Show and Junior Miss. When the radio job ended, Knudsen did summer stock in Chicago before moving to New York in late 1941. There legendary actress Helen Hayes hired her to perform in a radio drama before her big break came in the spring of 1942. While serving as a hostess at the American Theater Wing’s Stage Door Canteen she impressed Ben Boyer. Boyer worked as a general manager for Max Gordon, the producer of the Broadway play “My Sister Eileen.” Boyer gave Knudsen a chance to read for Gordon, who offered her the title role of Eileen Sherwood, originated by Jo Ann Sayers (Sayers left the cast to get married). Peggy debuted in “My Sister Eileen” on June 3, 1942, at the Biltmore Theater; the play moved to the Martin Beck Theater that August. She shared the stage with Joseph Buloff and Shirley Booth and appeared in the play for eight months. Knudsen traveled to Hollywood to do several screen tests, and Warner Brothers signed her in February of 1945. Her first movie was in a small role in A Stolen Life (1946), starring Glenn Ford and Bette Davis, in which Davis played twin sisters. Knudsen made four more movies that year, including The Big Sleep with Humphrey Bogart and Lauren Bacall portraying Mona Mars, wife of gangster Eddie Mars. It’s a small but important role, including a memorable scene with both Bogart and Bacall. In 1946 she also appeared in Shadow of a Woman, Never Say Goodbye with Errol Flynn and Eleanor Parker, and Humoresque with Joan Crawford and John Garfield. Knudsen had many relatives living in Duluth and had returned home for visits in 1941 and 1944. In May of 1947 she was again in Duluth as a featured performer in the four-day Northern Lakes Sportsmen’s Show at the Armory. She made four more movies that year, including Roses Are Red, in which she starred. For the next ten years, Knudsen appeared in nearly a film a year, including Copper Canyon (1950), with Ray Milland and Hedy Lamarr, and Good Morning, Miss Dove (1955), in which she appeared as Nurse Green with her longtime friend Jennifer Jones. On June 15, 1949, Peggy married James C. Jordan, the son of James and Marian Jordan, stars of the Fibber McGee and Molly radio show. Together they had two daughters, Janice and Marian. 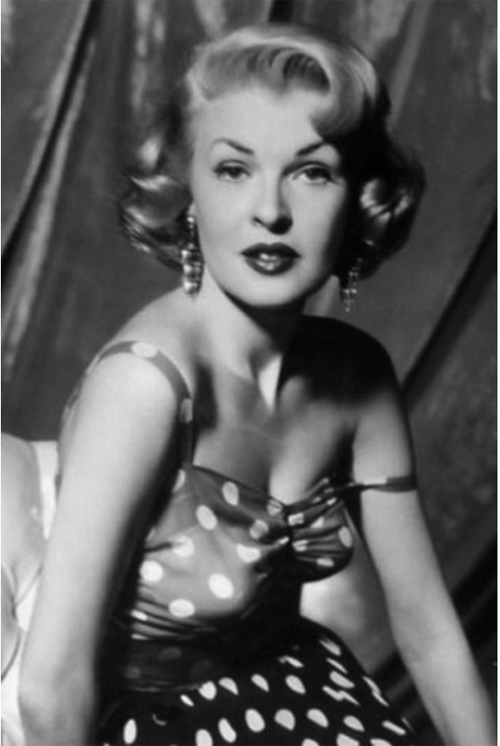 During the 1950s and early 1960s, Peggy appeared in many television shows, including Alfred Hitchcock Presents, The Millionaire, Bat Masterson, Perry Mason, General Electric Theater, and The Adventures of Ozzie & Harriet and starred as April Adams on all 24 episodes of 1955’s So This is Hollywood. On February 8, 1960, Knudsen was honored with a star on the Hollywood Walk of Fame in recognition of her work in television. Her marriage to Jordan ended in divorce on October 22, 1960. She married again in February of 1962 to Francis S. Kellstrom, but that only lasted a few months and they were divorced that October. That year she appeared in a television pilot called Howie in which she plays Paul Lynde’s wife. CBS executives decided not to purchase the show. In the mid-1960s Knudsen stopped working because of worsening arthritis that was concentrated in her hips. Over the next 15 years she underwent seven operations but the condition didn’t improve. When she visited relatives in Duluth in July of 1972 while recovering from surgery she needed a cane to walk. In her later years she was an active supporter of the Arthritis Foundation and appeared in many of their telethons. Peggy Knudsen died in Encino, California, on July 11, 1980, at the age of 57, and is buried in the San Fernando Mission Cemetery in Mission Hills, California.